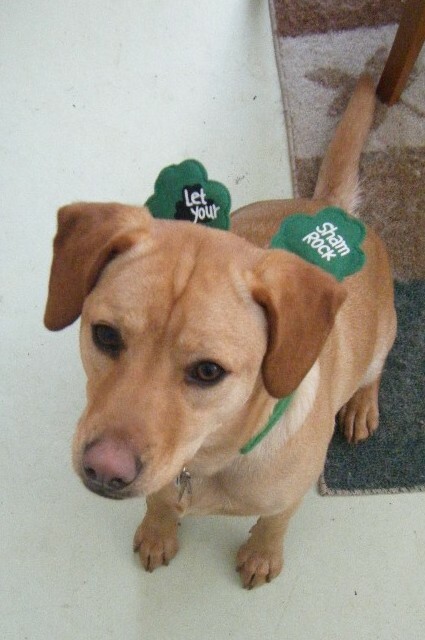 In my eternal quest to humiliate this dog, I tried to force her into week-late St. Patrick's festivities. Anyway. When I was humiliating myself over at knitting class this weekend, I passed a house for sale that I liked, so tonight Marvin and I drove over to look at it. Because we can so afford a new house. And because we just bought this house last year, so what could be more practical than thinking about buying another house? And because the economy is so special. But what the hay. We didn't have anything else to do. Well. Except I brought work home. And we have to practice Tallulah's dog training things. But other than that. 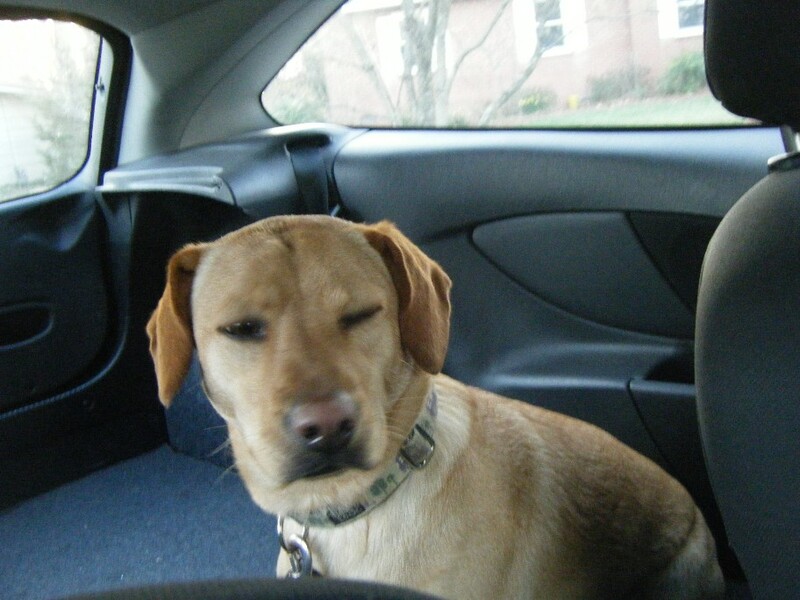 Anyway, we took the dog with us, and put her in Marvin's hatchback, where I managed to get another humiliating photo of her. Because you know what Tallulah hates? She hates riding in the hatchback part when there are two perfectly good laps right there in the front seat to plop her 47.9 pounds on. Smell this. I ain't ridin' in no humiliatin' hatchback part. 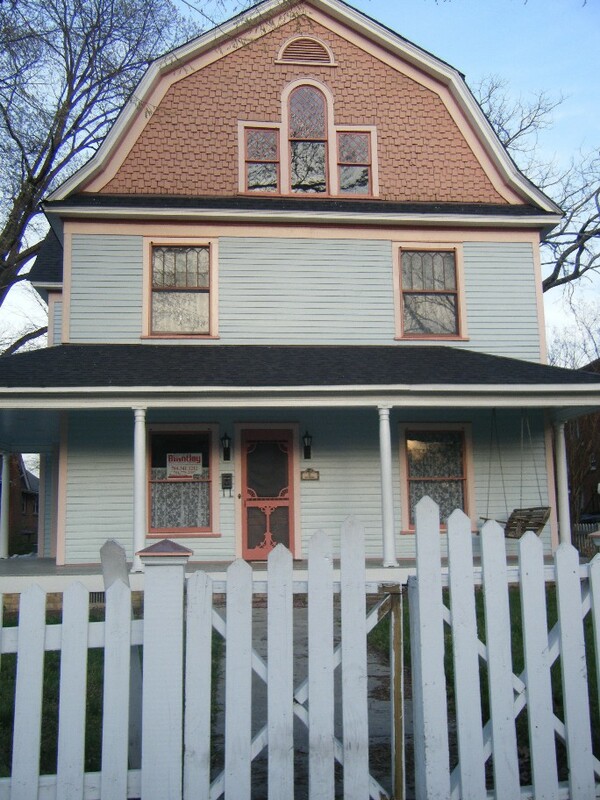 Anyway, I like this house that is for sale near the knitting store. Does it NEED to be so light blue? No, it does not. But that can be fixed. It has all my things. A picket fence. A wooden screen door that makes the flappy sound like the wooden screen door in The Waltons. A porch swing. Big old windows. THREE FLOORS. Do you know how many pets we could have if we had three floors? Marvin said, "It probably costs $250,000." And then we laughed, because we both would have gleefully stampeded on our mothers with a herd of giraffes for a $250,000 house in LA. And now we act like that is such a costly amount. But now it is. Because we make ninety billion dollars less than we did in LA. All this house needs is a little fixing up. A little landscaping. A little less blue paint. Oh, I could sit on that porch swing and never be sad again. With my 20 new pets. I could flap that screen door open and shut all day. I could go to the third floor while Marvin watches a Who documentary on the first floor. Tallulah could stand behind the picket fence and wag at everyone who walked by, unless they were little dogs, in which case she could bark. She kind of discriminates. I don't know what to tell you about my sizeist dog. Yeah. I guess I am not buying this big, blue house. I guess I will not be letting my sham rock in all those rooms. I'll bet it's cool inside. Don't you think? Previous Post KY, Miracle Whip, yarn. I’m all over the place, really. Next Post Pink pink pink pink. Drink. If you had three floors, you could send MARVIN to the top–as in, banish him to his Who documentary room. Make it soundproof and able to be locked from the outside. Just a suggestion. I am so with you in this house, June. It really is that homey! I live in an old Victorian cottage myself and it has a front porch, but no porch swing. The porch roof needs some work… I’ve already gotten a wooden screen door for the back, but I’m still looking for that perfect one for the front. The one on this one looks good. Maybe I could steal it? I love how nice and big this place is, but I know keeping it up would kill me. I have limits. I’ve found them. I’m all about the many pets, too! Soon our house will have a new puppy — because 2 dogs, a cat, and a tortoise are not enough! LOL – I thought Amityville house too!! Let me guess: The reason the St. Patrick’s Day photo shoot is a late is because you waited for the Let Your Sham Rock gear to go on 75% off day after sale? Right? June- I hate to sound overly practical, but, I’m betting for less than the price of closing costs you could add a screen door and even a porch to your current house. Can you tell I’ve been reading the Remodeling Guy & the Nester? That house does not look like the Amityville house which has that shape on the SIDE of the house, not at the front. The hipped roof looks like Gramma’s house. I think that’s part of what appeals to you. I like it, and you should go look at the inside. Why not? OK, Junie. First off, that’s a very cute house. Second, even if it is haunted, that’s not always necessarily a bad thing. As you may recall, our house was haunted when we first moved in. Mind you, our house was built in 1800 and has quite the history, as we live in Salem, MA, the original center of commerce for the US. ANNNNyway, we had ghosties who were quite active when we first moved in. Many, many individuals who’ve been in this house have experienced the exact same phenomenon, so I’m not making this up! Nothing bad, but you could hear them on occasion. They only really messed with my husband when I was away, but again, nothing horrible. However, once we moved in, fixed up the house and the house started being a happy place, the ghosties moved on. We’ve been ghost free for 3 or 4 years now! Shortly after the movie came out about the Amityville Horror House, I went to go see it (the house, not the movie) with my cool aunt. She was driving and she pulled up across the street from the house and shut off the engine. We sat and looked at the house for a bit. No one was out on the street, it was a quiet day. Suddenly there was a big BOOM and something hit my side of the car. Only there wasn’t anything there. No people, no animals, nothing was thrown at the car. NOTHING. Just a BOOM. She said, “D-d-d-d-d-d-d-did y-y-y-y-y-y-you h-h-h-h-h-hear th-th-th-th-th-that?” and I said, “Y-y-y-y-y-y-yes” and she started the car and we got the hell out of there. I’d keep the blue if I were you. I think the house looks super cute and the blue makes it look like a giant cake. It giant as well! You just don’t get houses that cake-y in the UK. I think if the house was haunted it would just add to the charm…I love me a good haunted house. I would bet that there are some great old pictures of that house somewhere and so wonderful stories (and pictures) of the people who lived there. TOO much fun! I do like the house. We are into period houses, we have one, well had one built 32 years ago. I have two words for these wonderful old homes, HIGH MAINTENANCE!!!!! Do your research, check out the cost of utilities, especially the heating cost. I thought it was an adorable house. I came to say so and found that everybody went all poltergeisty. But I can see why you love it. Honestly, I love the color scheme. Maybe because I grew up in neighborhoods with houses like that. Have to agree on the whole Amityville thing. When we moved to New England, I wouldn’t even go look at a gambrel style house with it’s two window eyes looking back at me. It would probably be cheaper for you guys to add a porch, swing & picket fence to your house. What is with all the hatin’ on the Dutch Colonial? It’s charming. Love old houses and wouldn’t live in a new one for a 100,000 dollar raise and a miniatire cow. Buy it, do it in “Painted Lady Victorian” like she deserves and name the polterguist, “Mr. Wiggles”. I’m with the correspondent from the ‘burbs. A porch swing on a big front porch (with the cute screen door) and near a craft-type store…yeah, baby! As for any possibility of haunting, just let Lula and Winston team up for an exorcism. Marvin can come up with appropriate theme music and I can just see June with her knitting needles at the ready while wearing that killer red dress with her scary fluffy hair. Oh Junie Bird! This house so so reminds me of my sissy Jan’s house who is NOT comenting because SHE went on a little vaca with her family. Hmmph. Anyway, this is very similar to her house. She has a great front porch, a flappy door (well not really but would if it ididnt have a sensible storm door) and of course, her house is yellow, not blue. But really, its similar…sort of. In the farmhousy, just a swingin, cozy on up with the kitties that undoubtedly live there kinda way. What the keck? Find out how much that bad boy is. Near the knitting store? Porch swing? I am so there. Wow, i was thinking Amityville but, didn’t want to rain on your parade. Well, i read the comments and it’s pouring! This house screams haunted to me. The last time i was in one it was NOT a fun experience, in fact the house was tore down because no one could live in it. Wooooooooo! 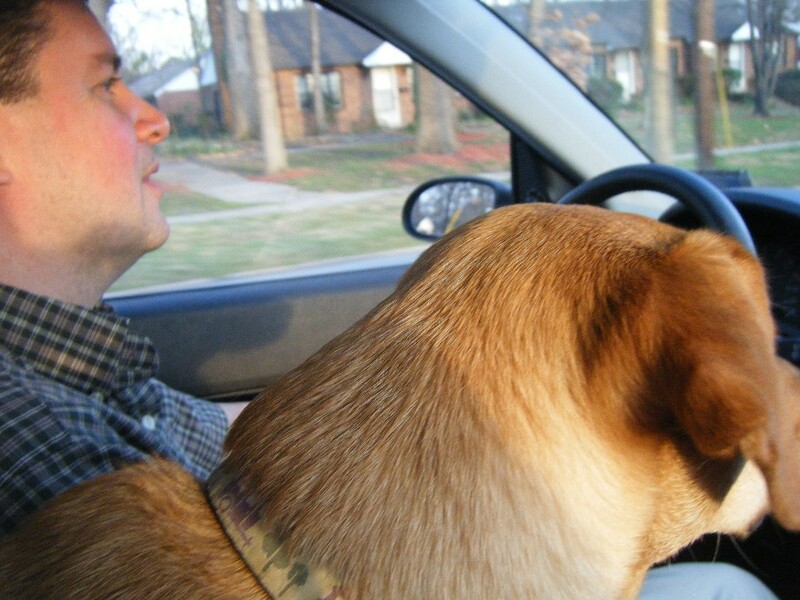 On a lighter note i love seeing photos of your cute doggie…can you get her cloned for me? Hmm methinks that if this is in Greensboro it is not a good part of town. Theory. I’m guessing downtown or south of downtown. The house you live in now is so much cuter!! You need to do a internet search and see if they have any pictures of the inside. I love the screen door. Ok first of all how cute is that babydoggie? Second of all I love her expression. Thirdly that house looks like a lot of work. D – The houses have come down about 40% in prices in L.A. so that means that $250K will now buy you 1/4 of a closet in Hollywood. Aside from the house screaming AMITYVILLE-AMITYVILLE-AMITYVILLE… I think it’s cute. I am so loving the “candid” pictures of Lula, that she so obviously poses nicely for. I love it! Definitely needs paint, but what a charming house. You really owe yourself to at least LOOK at the inside. It doesn’t cost anything to look, and besides, I want to see inside too and Greensboro is 3.5 hours away from here so I need to see your photos. Charming, but this house screams high maintenance. Oh .. I can see you now June .. just a sittin’ and a swingin’ and a knittin’ on yer porch. I must admit though I did think the same as your first commenter .. it is a little Ammityville’ish. JUNE! It is such a sweet house…how can you resist? A porch swing is a must…if you have a porch that is. I swear people up here is the PNW dont know about them…I get mad every time I drive by a house with a porch and no porch swing! If you do buy it can I come over? oh, and yes, it is an ugly color. What color would you paint it? I’ll bet it’s very cool (and possibly cold, in winter) inside. Did you go into the house? Did you ask how much it was? Doesn’t hurt to ask! June — I read your blog daily, and I have never commented — actually, I have never commented on anybody’s site. I just like to read blogs and comment in my own head!! Ha Ha! You are too funny!!! I live in SoCal, have all my life. I’m in Orange County though, not LA. But, the real reason I am jumping into the whole “comment” pool is because that house is not for you. It reminds me a bit of the Amityville house. Scary.